Updated Thursday May 10, 2018 by LYB. Phil’s family was instrumental in establishing LYB and much of his sense of duty towards the league was rooted in his family and community connections. Phil became affiliated with LYB 37 years ago as a player for the league. He played from T-ball division through Sr. Division where he aged out and transitioned into coaching, first as an assistant coach and later as a team manager. Phil also served on the board of LYB in a variety of roles through the years, most often as a Division Rep, the Safety Director, or Equipment Manager. He was also an umpire at the league and served as an assistant to the Umpire Chief for scheduling. Purpose: This award is made in honor of Phillip S. “Phil” Edwards, a longtime volunteer at Lakeside Youth Baseball. Phil passed away in December and we have established this award to honor his memory and the spirit of community, volunteerism, and sportsmanship that Phil demonstrated throughout his life. 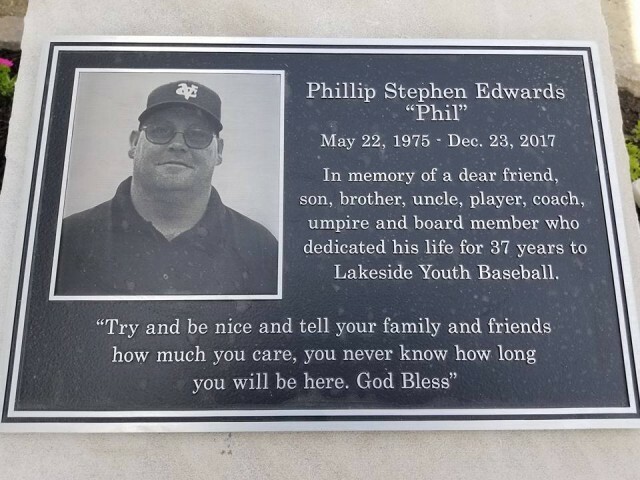 This is planned to be an annual award to a child who demonstrates the same love of the game, dedication, and sportsmanship that Phil was known for. Selected child will be the one who best demonstrates the spirit of sportsmanship and teamwork Phil tried to instill in all the children he coached and represents LYB in the most favorable manner. Coaches, Team Moms, and Umpires will be evaluating the kids throughout the season for nominations that will occur the last few weeks of the season. External links are provided for reference purposes. Lakeside Youth Baseball is not responsible for the content of external Internet sites. Copyright Lakeside Youth Baseball All rights Reserved.